I’m guessing you all know the AMC Javelin. But do you know its Australian cousin - the AMI Matador Javelin? AMI (Australian Motor Industries) could trace its history back to 1926. In that year, JF Crosby acquired Eclipse Motor Pty Ltd of Melbourne, followed by Victory’s distribution agency for the Standard Motor Company in 1929. In 1958 the company was renamed Australian Motor Industries after a deal negotiated with Mercedes-Benz to assemble their vehicles for the local market, alongside the likes of the Standard Vanguard, Triumph Herald and even Ferguson tractors. This arrangement lasted until 1965. 1960 saw another deal struck, but this time with AMC to import Completely Knocked Down (CKD) kits for construction in right-hand drive form for the Aussie market. Some of AMC’s most highly regarded muscle cars made their way to our shores, namely the Rebel, Matador and Hornet, although we didn’t receive the V8 in the latter. Best remembered was the Javelin and AMX, the only American muscle cars of the type to be built and sold in the country. In America, these models were performance-orientated muscle cars, especially the strictly two-seat AMX. But here in Australia both cars were marketed as “super” personal luxury cars. There wasn’t much in the way of optional extras, as everything was standard. 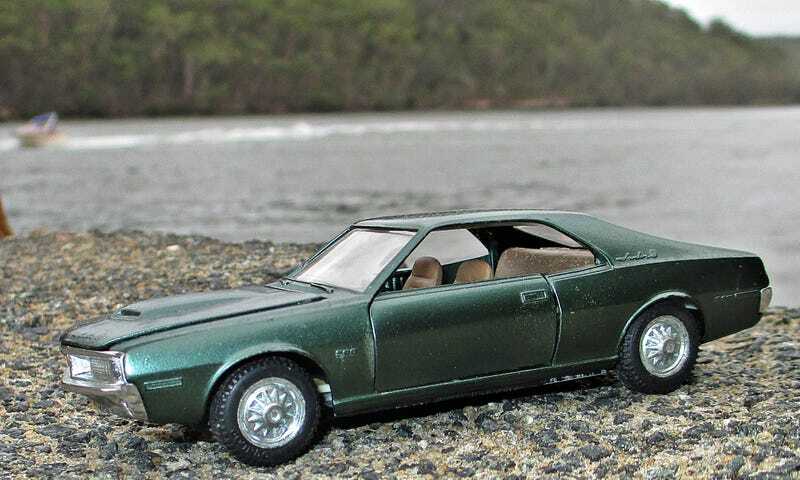 The Javelin/AMX came equipped with a 210kW 5.6-litre V8, three-speed automatic, power steering, power disc brakes and a ‘twin-grip’ limited slip diff. All these high-end features didn’t make the car cheap; the asking price in 1968 was $7495, which was considerably more than the Javelin’s main rivals, Holden’s HK Monaro GTS with 327 CID V8 ($3790) and Ford’s XT GT Falcon ($4200). This resulted in poor sales and the Javelin disappeared from showrooms by 1972 with a total of 258 models produced. AMX numbers were much lower, with only 24 cars leaving the factory in 1969. AMI continued to make the Matador and the Hornet until 1977, albeit in small numbers. The company’s last AMC model was the Gremlin, before mainly focusing on the construction of Toyota vehicles until it was fully acquired by the Japanese juggernaut. AMI’s Port Melbourne was used by Toyota Australia until it shut its doors on October 3 last year. The model you see here is a 1970s casting by Spanish maker Pilen in 1/43 - with all the opening features you could expect at that time - and a few QC issues that were equally typical of the era. But you got everything opening, reclining seats - and badminton rackets on the parcel shelf - and that’s kind of awesome!